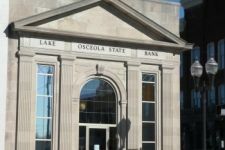 Lake-Osceola State Bank, a locally owned community bank, is in the business of successfully providing financial products and services. We will provide Customer Care by determining their needs and striving to exceed their expectations. We will work side by side with the community to support, assist, and promote improvement to our quality of life. Chartered in 1908 we have operated continuously in Lake County. Our main office is located just blocks away from the original building. For our first 55 years of existence we operated with only one office; Baldwin. In 1963 we purchased Luther, and Tustin. We operated with these three offices for 32 years until 1995 when we began to expand by purchasing and opening new offices. From 1995-2006 we added four branches, Irons, Wellston, Reed City, and Big Rapids. Currently we operate all seven of our original branches. We are in the process of opening a second branch in the Big Rapids Market. We are still a privately held institution. The majority of our shares of stock are held by three families deeply rooted in our history and traditions. These three families are the Smith Family, the McPhail Family, and the Wenger Family. Our rich history of involvement and family traditions truly make us a community bank.